An essential for every modern gentleman's wardrobe, our Classic Sterling Silver Cufflinks bridge effortless simplicity and superior craftsmanship. From intricate engine-turned motifs to pared down hammered borders and domed silhouettes, the appeal lies within the understatement of these chain linked cufflinks. 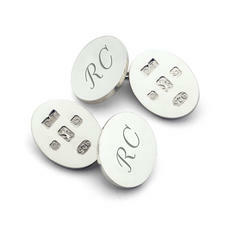 Leaving ample room for engraved initials, they make a unique and personal gift; all the more charming when presented in a leather cufflink box. Paired with a meticulously handcrafted designer leather belt, they're the cornerstone of professional and formal style.